VEX Skyrise is played on a 12’x12’ square field configured as seen above. 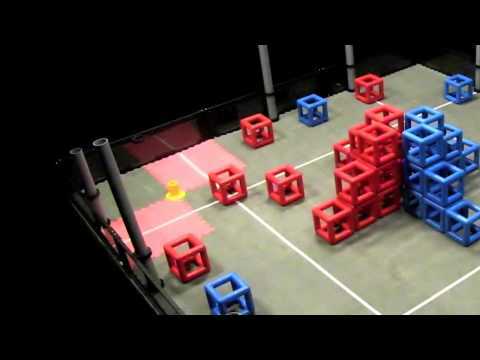 Two alliances – one “red” and one “blue” – composed of two teams each, compete in matches consisting of a fifteen second autonomous period followed by one minute and forty-five seconds of driver-controlled play. Each Robot (smaller than 18”x18”x18” to start) begins a match on one of their Alliance Starting Tiles. There are ten (10) Posts and four (4) Floor Goals that Robots can Score Objectsonto. The Alliance with the topmost Cube on a Post Owns the Post. Alliances also earn points for Building Skyrises on their Skyrise Base out of Skyrise Sections, and Scoring Cubes on Skyrises. A bonus is awarded to the Alliance that has the most total points at the end of the Autonomous Period. VEX Robotics Competition Qualifying event for the Provincial Championships.